Kicked out of the USA? Although probably we never entered? Either way it was a new travel experience and an unexpected one. We all had current ‘ESTAs’ (Electronic System for Travel Authorization), but none of us had realised we weren’t eligible for the visa waiver program because we weren’t arriving by an approved form of transport. Turning up in your own (temporarily at least) boat doesn’t count. The solution? We got back in the tender, shot back to West End in the British Virgin Islands (about the same distance away as our original BVI departure point), arrived there minutes before the West End-Cruz Bay ferry pulled out and 40 minutes later we were right back at the same immigration office desk, in the same building, on the same dock. 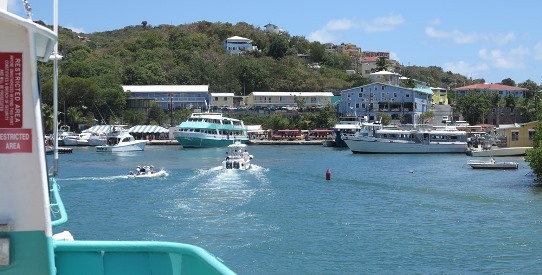 We were also US$300 poorer – US$35 for the ferry and US$15 for BVI departure tax for each of us. This time we entered the US with no problems. Silly? Yes. ▲ Arriving in Cruz Bay on the ferry from West End. • You don’t need an ESTA to enter the US by land across the US or Canadian border, but you still pay US$6 for the privilege (versus US$14 for the two year ESTA). Strangely the Vancouver-Seattle ferry counts as a ‘land’ trip! • If we’d known about the problem presumably we would have all applied for US visitor visas although in fact that would probably have taken more time and worked out more expensive than our short return trip to the British Virgin Islands. • Arrive in the US on an ESTA and you can stay for 90 days. But let’s say you arrive in the US in Miami and leave on Day 2 for somewhere in the Caribbean. Come back to the US on Day 89 and you’ve now only got one day left before your 90 days are up and you must depart the US. That’s because the entire Caribbean counts as a sort of subsidiary USA (even Cuba?) and going there is not a ‘meaningful departure’ from the USA. At least that’s what lots of people on the web seem to say. • Or perhaps the whole thing was up to the immigration official’s discretion and if he’d been in a better mood he could have said ‘welcome to the USA’ and stamped our passports. Just like he did an hour or so later.